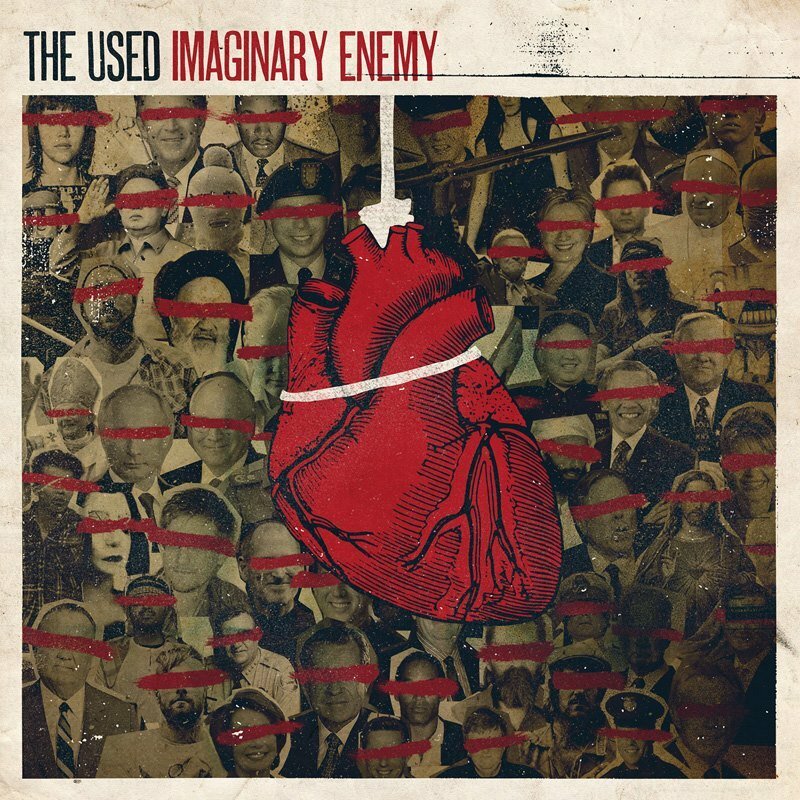 The Used are a band who’ve built their career by doing things their own way, and their records have always been memorable in distinct ways, but Imaginary Enemy is their most concise and rallying yet, taking the voice they’ve established over the last decade and giving it renewed purpose. In this sense Imaginary Enemy is the best thing the band have done; it’s more mature and focused, powered by thousands of voices and individuals that undoubtedly feel the same way as vocalist / protest march leader Bert McCracken. The Used have written a record that serves more as an open letter than a piece of music. It’s almost as if it’s written to rally and unite against corrupt leaders and lazy officials, packing in churning anthems alongside a genuine message that speaks volumes more than their past work. The Used are all for a revolution, and they want you on-board. It makes sense then, that Imaginary Energy starts with a song entitled Revolution, and in doing so lights the flame almost instantly, bursting into life after a brief spoken word intro from Albie Sachs, an activist and judge (if I’ve done my homework right). There’s a few of these quotes littered throughout Imaginary Enemy, including one from ex-president Dwight Eisenhower on A Song To Stifle Imperial Progression (A Work In Progress) and they well complement the overall theme, as do the famous faces of leaders, tyrants and politicians that make up the records artwork. Instead of sounding cheap these samples add something else to the songs, backing up an already powerful message that shines through on A Song To Stifle… more than any other track. Whereas The Used’s last album Vulnerable sounded relatively tame, opener Revolution holds nothing back, churning along with heavy instrumentals and bringing back the roars and screams that didn’t really feature on the bands past few releases. Revolution calls for arms (‘we looked at the price tag and it’s one we can’t afford / we were taught that progression meant accumulating more’) and it’s a song that packs a punch, forcing a listener to follow suit with a huge chorus. There’s occasionally an issue in starting a record with its strongest track, but Revolution marks a sign of intent, and raises the flag that the band continue to wave throughout, making for a solid introduction to an equally solid album. If one thing is blatantly clear on Imaginary Enemy, apart from its anti-establishment message it’s that The Used know how to write a song. The pacing and writing on the record is immaculate and polished, as we’ve come to expect from the band, meaning that Imaginary Enemy sounds larger than life at times. A Song To Stifle… is one of the better examples, launching into a sonic barrage and furious intensity before a sublime transition into a catchy and rousing chorus, as McCracken shouts ‘We’re saying no way, no way USA’ in a manner that demands the line be shouted back with just as much enthusiasm. Preceding track El-Oh-Vee-Ee features weaker verses but a chorus that is nothing short of anthemic as vocals climb and instrumentals crash. There’s a distinctly pop feel to it, which isn’t quite the gross-pop of Artwork but instead keeps the energy and channels it into a radio-friendly rock song which is thoroughly memorable. The brilliant Make Believe could have easily been plucked from In Love And Death, meaning there’s a refreshing nostalgia to it, whilst the title track is another shining example of The Used at their best, featuring a catchy bass line, emphatic breakdown and towering, pounding chorus. Kenna Song slows things down completely and offers a respite of sorts as it hazily drifts from start to finish as McCracken inspires and rallies alongside marching band drums and lighter waving euphoria, whilst following selection Force Without Violence carries the same message but does so with more heart, as the line ‘These walls won’t keep us safe when they hold us back like barricades’ rings out during another experimental chorus. The track ends with an interesting and thought-provoking poem told with a metallic venom and darkness reminiscent of Lies For The Liars. Only a few songs on Imaginary Enemy differ from the established agenda, and these are lead single Cry and closer Overdose. The former is another great track that fuses electronic elements and hooks aplenty with one of the records best choruses, and one which has been stuck in my head since its initial release a few months back. There’s a pop feel to this track as well, despite the heavy final minute which is relentless and intense, and it’s a style The Used have toyed with throughout their career, but they nail it here. Overdose is fittingly low-key for a closer, although it does run the risk of being sickly sweet as McCracken sings of love above dreamy, coasting instrumentals. It reminded me of Smother Me from Lies For The Liars and at times it is suffocating in its emotional outpourings. Maybe it’s just me, but Overdose stands out, and mostly does so for the wrong reasons, detracting from and cheapening the ten tracks that precede it. After seven minutes of silence it unfolds into Secret Song, which features a Siri-styled spoken word life lesson of sorts, and is only really worth listening to once for the novelty, ending the album on a lull after forty-five minutes or so of quality. The record has its flaws, as does any The Used album, and these come in the form of the latter primarily. The chorus of Generation Throwaway should sound far bigger than it does, whilst the lengthy and blossoming Evolution falls a little flat despite being one of the best tracks lyrically. Despite its few shortcomings The Used have made an album that matters more than anything they’ve ever released. Where their eponymous debut helped define a genre their sixth album is just as revolutionary. Imaginary Enemy marks a triumphant return to form, and for myself it’s up there with Artwork as one of the best things they’ve done to date. The Used are still going strong, and with the energy and fire they capture so well on Imaginary Enemy there’s no signs of them burning out just yet.